: Aquademin,Myristic Acid, Glycerin, Lauric Acid, Sodium Laureth Sulfate, Glycol Distearate, Potassium Hydroxide, Lauryl Hydroxysultaine, Stearic Acid, Palmitic Acid, Acrylate Copolymer, Fragrance Rivera Fresh, Aloe Barbadensis Leaf Juice, Methylparaben, Salicylic Acid, Lysine Thiazolidine Carboxylate, Amylopectin, Dextrin, Xanthan Gum, Tocopheryl Acetate, Lysine Carboxymethyl Cysteinate, CI. 19140, Propylene Glycol, Diazolidinyl Urea, CI. 42090, Propylparaben. 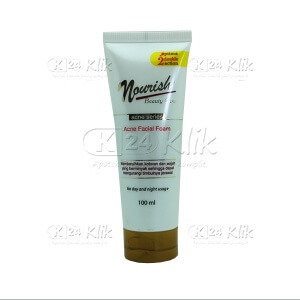 : Referensi NOURISH BEAUTY ACNE FACIAL FOAM diambil dari berbagai macam sumber.